The E-Web Heavy Blaster Team is a crew operated emplacement guns so large that they take considerable effort to be moved by hand. The E-Web Heavy Blaster is the Empire’s second support unit and is ideal for forces that need a little help controlling troops or guarding an area. The E-Web Heavy Blaster is a low mobility emplacement weapon platform, its primary job is putting out a consistent amount of firepower turn after turn in a focused area. The E-Web is of average survivability with 4 health, and its damage is slightly below average (by 0.125 points). However its attrition value means it will get more big attacks throughout a game because it will need to take 4 wounds before you slow its damage dealing. So although its turn by turn damage is a little low, over the course of an entire game its efficiency is actually very high. The E-Web also has the new keyword Sentinel meaning it can use its standby tokens from a much greater distance, increasing its opportunity to take the optimal attack each round and increasing its ability to control and protect an area. The E-Web has a Generator and a Comms upgrade slot. At 55 points it has a small amount of room to upgrade before it starts to become inefficient but most people will want to skip upgrading it. 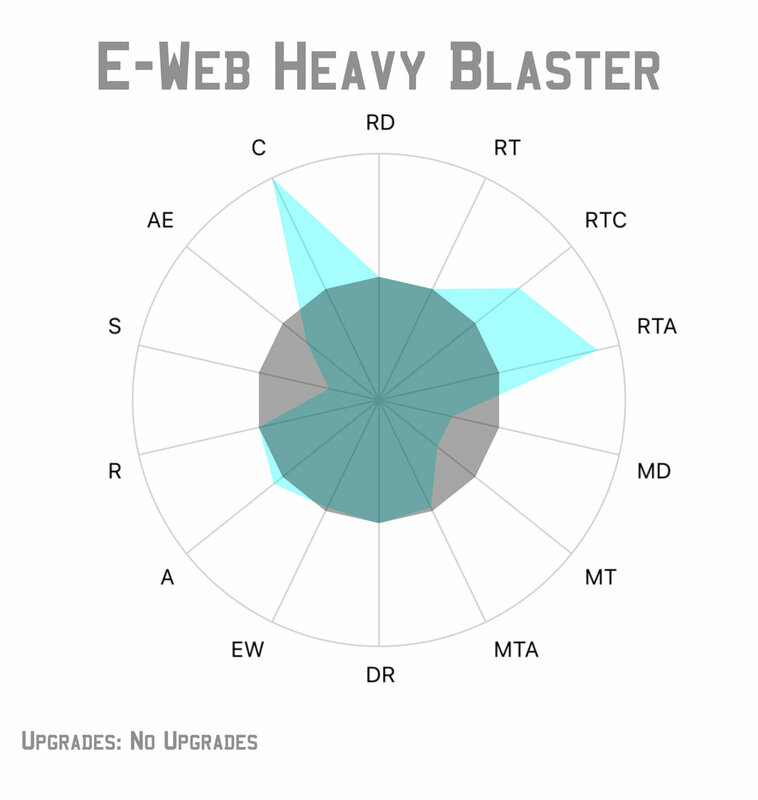 The most common build for the E-Web other than no upgrades is a Barrage Generator to add suppressive and slightly increase the damage from 2.875 to 3.65. Because the generator exhausts to add the the damage and suppression most people also pair it with an HQ Uplink which allows you to activate the E-Web when you need it as well as to increase the efficiency of the recover action that you will need to take for the generator. However using the generator and recovering is slightly less efficient than taking a basic aim action. The Overcharged Generator is also a valid option on the E Web, it is used in the same way as the Barrage Generator but it adds .625 damage instead of .75 and adds Impact 1 instead of the extra Suppressive - however the E-Webs innate surge to crit and the Empires easy access to Impact make this a less desirable upgrade. Because the E-Web is so slow its tactics are pretty simple, however they must all be figured out before deployment which is the critical part. In general the E-Web is best deployed where it can advance to and defend an objective - ideally in a location it can also claim that objective - the E-Web is a good candidate for Sabotage, Recover, Key Positions, and Intercept because of its high courage and desire to stay in one spot. Note that Emplacement Troopers cannot climb or clamber, so while you can deploy them on elevated terrain, if you do they cannot get down during the game. Sometimes the height advantage is worth the loss in mobility, but it is terrain and scenario dependent. Once the E-Web has gotten into place it is going to more or less sit and put out damage and suppression. On turns that it can’t take a shot immediately it can stand by and wait for a unit to come into its extended sentinel range. However if you are using the HQ Uplink build you will rarely use stand by as you will be able to control when it activates each turn. The most critical part of getting the most out of your E-Web is picking the appropriate target at the appropriate time whether that is finishing off an injured unit, punching some damage into a vehicle or suppressing an opponent’s crucial troops. also keep in mind that Emplacement Troopers follow all of the rules of regular troopers in addition to the additional rules of Emplacement Troopers. So the E-Webn can capture objective and even deploy via the Rapid Reinforcements condition card. another often overlooked strategy is taking a standby action on the E-Web. the E-Web has both the Plodding and Cumbersome keywords meaning it can only move once per activation, and cannot shoot and move in the same activation. however abilities that grant out of activation moves and attacks such as standby circumvent both keywords. So an E-Web can move and then stand by, and when it’s stand by is triggered it can use that action to either move again or shoot. because it is not during an activation that it moved, it is not limited by either keywords. When playing against an E-Web Heavy Blaster without upgrades it doesn’t pose any more of a threat than an equivalent unit of Stormtroopers. If it is a Barrage Generator variant it will rank much higher on your threat list and will need to be dealt with or it will suppress and shut down your units. You can engage these like any other basic corps unit, but keep in mind that because it has such a high attrition value it doesn’t slow down until it is completely dead unlike normal units - so once you commit to engaging it you should finish in in one turn or you have wasted effort. Unlike the 1.4 FD Laser Canon it is a small figure and likely to get cover from buildings and barricades, in addition to its red defense dice this makes it much more effort to defeat. although its lower health makes it a bit more reasonable. If you can catch it in the open it should take 2 average units 1 turn to defeat, or 1 basic unit 2 turns. If it gets into heavy cover it can become much more difficult to remove and should try to be flanked or engaged with a unit that ignores cover if possible.